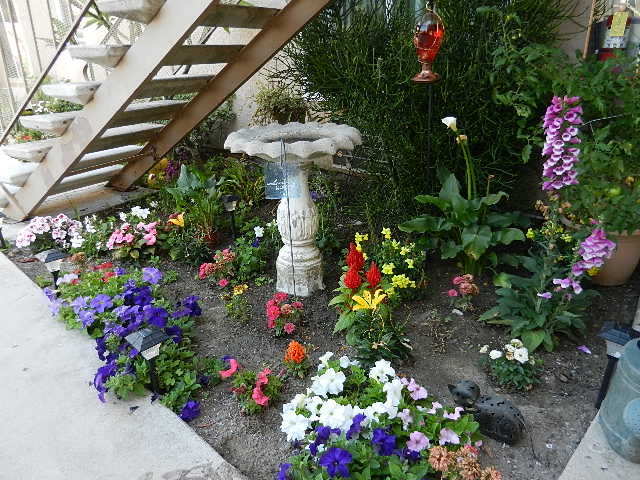 We don't have much room outside our apartments, but my neighbor planted a lovely wee garden under their steps. It really is. I love passing by there every day. Oh, what a perfect way to use and improve that space. It looks absolutely lovely. She takes such good care of the wee garden, and we all appreciate it. That's lovely - what a good use of space. Oh, well done your neighbour. What a wonderful bit of cheerful colour in a small and difficult space. We all really appreciate this beautiful space she's created. What a clever use of that space! Love it. Isn't that great? I love it. My neighbor's thumb must be green; she always has a lovely display. It's a pleasure to pass by.